Bets and Bryan were off to catch their train for trip number one of our stay late this evening (about 9:00 PM) so we would soon be home alone. This was our last day to learn a few survival techniques while the experts were in town. The experts were, of course, very busy on last minute preparations so our lessons had to be grabbed when possible. Bets and Bryan have a tenant, a French gentleman called Giles, living in a cottage on their property, so introductions were necessary. Giles also has un chat who, not wishing to be left out, dutifully wandered up and introduced itself to us in the traditional feline fashion, by winding itself around our legs. We couldn’t quite figure out the cat’s name but it seems to be based upon “gaffe” as in faire une gaffe (to make a blunder). Cute! I must quiz Giles when possible and get to the bottom of the mystery. Giles is apparently planning a weekend trip to Portland, Oregon (his real home base, I think) and was wondering what to do avec son chat pendant le voyage. Since we were already in charge of Betty, we naturally volunteered our services as globetrotting cat sitters. Because of the Inverse Packing Rule, Carol needed instructions for using the laundry equipment. We were also going to have to get to grips with Bets’s car. That might not seem very much but it is not just a car, this is a Toyota Camry Hybrid car with petrol power, battery power and a bunch of other Japanese technology involved. We decided to have a test trip into Petaluma about ten miles east. That way, as well as familiarizing ourselves with the car, we could find a more fully equipped food store into the bargain. The car comes with a key fob which, while needed, is rarely actually used. Simply have it about your person. Hmm. Put the key in your pocket, for example, walk up to the car and you can open the previously locked door. OK, we’re in. Search as one might, there is no ignition switch. There is however, a starter button on the dashboard which seems reminiscent of Jaguar sports saloons of old. Having entered the car with said key fob in ones pocket, one presses the starter button on the dashboard. Nothing happens. Well, more accurately, a light should begin to glow in the starter button indicating that power might be available. This is largely a matter of faith since the engine doesn’t actually burst into life; silence reigns. The car is now supposed to be able to begin moving as silently as a wraith on its battery power, turning on the somewhat more reassuring internal combustion engine only when it is good and ready. Weird. On my first attempt, that which should happen didn’t. No surprise there, then; no glowing light in the starter button and the automatic gear lever remained firmly locked in “park”. At this point, I didn’t actually know that I was supposed to get a glowing light. More by luck than judgement, a second attempt proved more fruitful but only because, quite by chance, I decided to take off the parking brake first and hold the car on the foot brake whilst trying. It’s the pressing of the foot brake while also pressing the magic starter button that is key, if you’ll pardon the pun. Even weirder! In practice, of course, the car’s air conditioning tends to be on in these climes meaning that, other than for the initial few feet, the batteries don’t get used and the internal combustion thingy is required. Life does, however, go eerily silent at traffic lights and junctions when the car turns off the internal combustion thingy pending a good bootful of force on the accelerator whereupon the much missed reassuring internal combustion noises return. One does seem to need the key fob actually to lock the car, though. Talk about hard work. 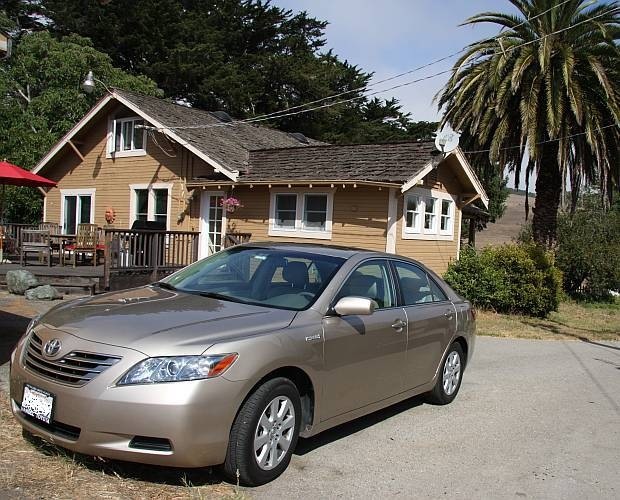 After a splendid prime rib dinner in the local intriguingly named William Tell restaurant in Tomales, Bets and Bryan left for the train in Bryan’s Subaru. As they disappeared into the night, though the headlights were on, we saw a complete absence of rear lights. Yikes! No phone calls; I guess they made it.